A quick view of the most influential metrics in University Heights. University Heights is a neighborhood in the central part of the city of San Diego, in the county of San Diego, California. The neighborhood is bordered by a mesa to the north and west, Boundary Street to the east and Lincoln Avenue to the south. It is home to both the Trolley Barn Park and to Shirley Ann Place, which is a historic district containing Spanish Colonial Revival bungalows built in the 1920s. Today this thriving neighborhood is home to many great housing options as well as coffee shops, studios and galleries, restaurants, boutiques and so much more. The area that would one day be University Heights was settled in 1888. Originally the name "University Heights" was chosen during the land boom of the 1880s because a branch of the University of Southern California was planned for the area. The proposed university was never developed and the tract of land was later used as a location for the State Normal School. During the Panama-California Exposition of 1915 the population and infrastructure of the area grew quickly. University Heights like man San Diego neighborhoods became connected with other parts of the city with the arrival of the Class 1 streetcars and an extensive San Diego public transit system. The trolley system was retired in 1939 and the local trolley barn was converted into a warehouse for the San Diego Paper Company. The barn was demolished in 1980 and the land was turned into the spacious and beautiful Old Trolley Barn Park. According to city-data.com, whose information dates from 2011, the neighborhood of University Heights spans 1.32 square miles and is home to 11,897 residents giving the community a population density of 10,509 people per square mile. Today, the Trolly Barn Park hosts free concerts in the summer and features playground, green spaces, a unique system of sidewalks and so much more. The site of the State Normal School is now the headquarters of the San Diego Unified School District. The city is home to unique dining options like The Farm House Cafe, Parkhouse eatery and Soltan Banoo. University Heights is also home to many nightspots including the Lei Lounge and even the Diversionary Theatre. The most popular style of home in the neighborhood are historic craftsman-styled homes. Homes for sale there range from starter homes up through large historic homes. In 2000, the average price for a single family home in University Heights was approximately $624,547. Rental properties include both houses and apartments with the median rental price at $984. Other real estate options include condominiums and town houses for sale or lease. Contact a local real estate agent today for assistance in finding the home of your dreams in lively and historic University Heights. View our selection of available properties in the University Heights area. 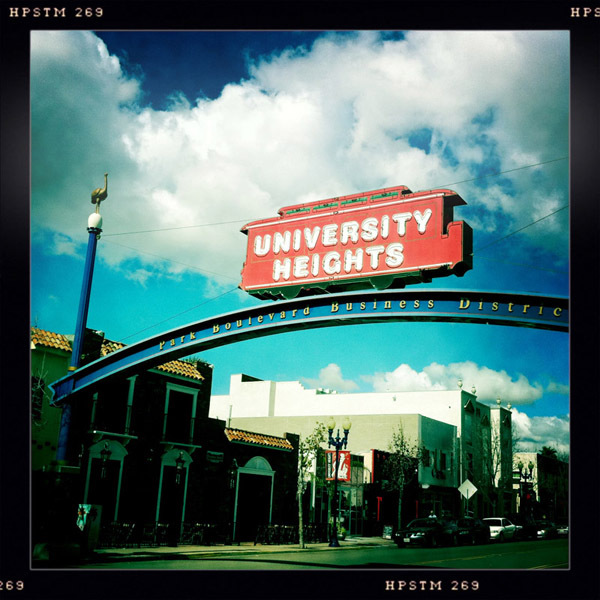 Check out the latest demographic information available for University Heights. Learn more about schools near University Heights complete with ratings and contact information. Browse through the top rated businesses in the most popular categories University Heights has to offer.